Hello everyone! I've just returned from a two-week Chinese New Year holiday and I'm still trying to get back into the swing of things. I miss you guys so much and sorry for couldn't drop by your site(s) while I was away. The first week was pretty packed with over 500 pictures taken during our trip. We arrived at Kota Kinabalu and stayed at cousin's place for one night. 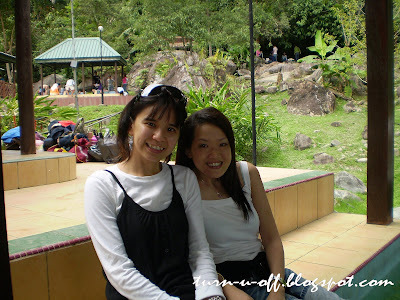 The next day we drove to Tenom, a small town (my mom's hometown) about three hours drive from Kota Kinabalu. 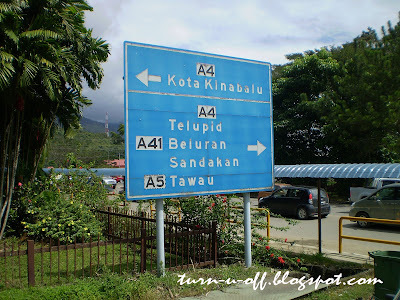 It is also known as the "gateway to Murut (a group of hill tribes) country". The dog's head-shaped of Sabah map. 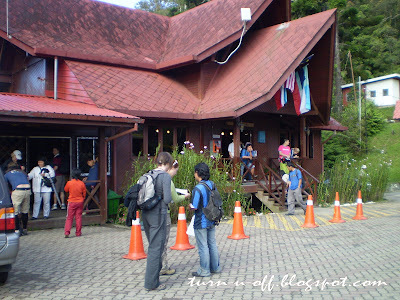 We checked-in at the comfortable, air-conditioned Tenom Fatt Choi Coffee Cabins upon arrival. The cabins stand majestically up a hill overlooking Tenom and a hanging bridge with the mighty Padas River roaring down the valleys. 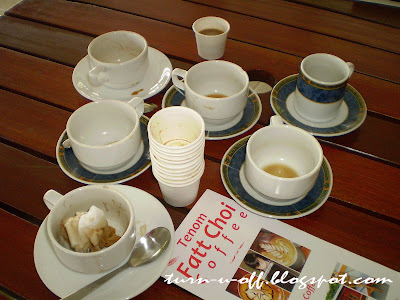 The following day, we visited Tenom Fatt Choi Cafe and coffee factory. 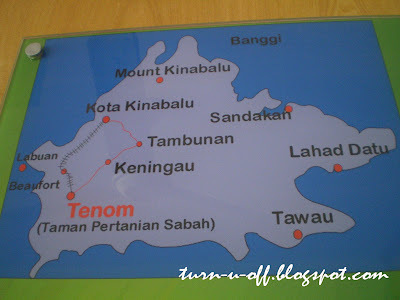 I didn't know that Tenom is famous for its coffee! 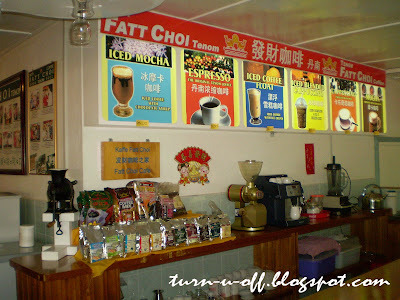 We expected nothing more than sitting around and sipping different flavors of complimentary Tenom Fatt Choi Coffee. It was baby Cammy's birthday on that day. So we drove back to Kota Kinabalu for her birthday party and stayed for another two nights in Kota Kinabalu. 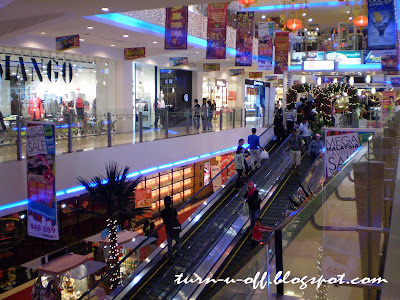 1 Borneo, the largest shopping and entertainment mall in Sabah. The reunion dinner on Chinese New Year's Eve at cousin's place. On the first day of CNY, we drove 3 hours to the north of Kota Kinabalu. 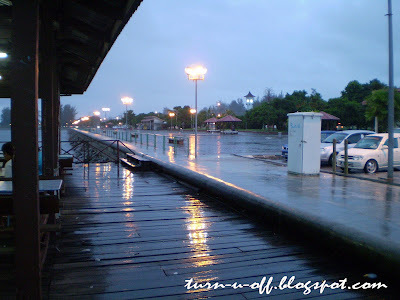 We went to Kudat, another small town (my dad's hometown) on the northern part of Sabah. 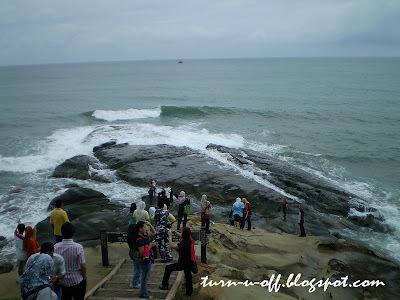 Tip of Borneo at Simpang Mengayau. 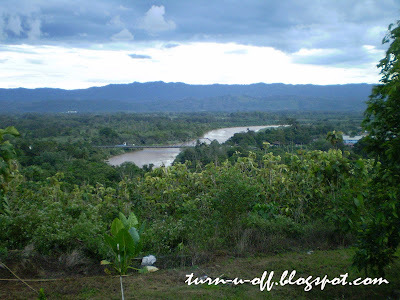 They say a visit to Sabah should not be complete without having seen the very Tip of Borneo at least! We were at one of the two ears in the "dog's head". We had our dinner at one of the floating restaurants at Sidek Esplanade by the seashore. There, we were recommended The Rest House Kudat for the night stay. 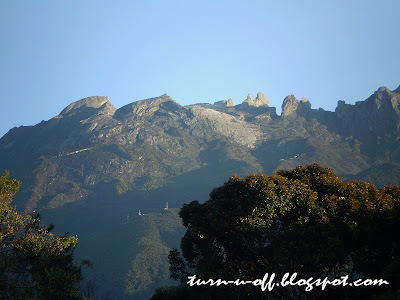 The next day, we were off to Kundasang, the closest village to Mount Kinabalu. 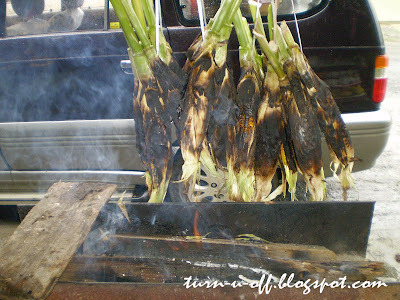 Along the way, we stopped over at one of the stalls selling jagung bakar (roasted corn). We passed by Kota Belud, stopped at Pekan Nabalu for lunch and to refresh ourselves. 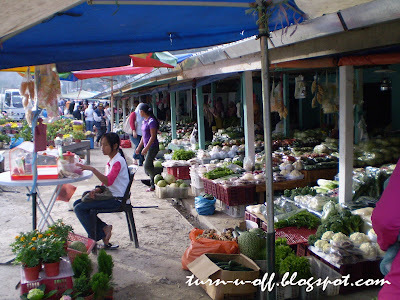 Wholesale vegetables market along the roadside in Kundasang. 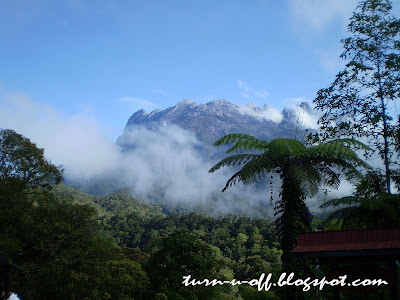 A view from Kinabalu National Park. 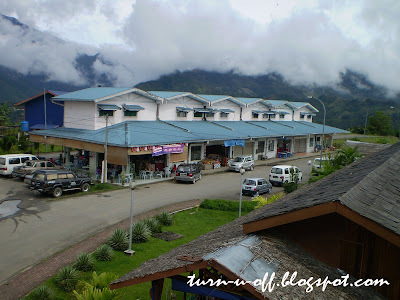 We had our lunch Ranau, the nearest town to Mount Kinabalu, and district in the West Coast Division of Sabah. 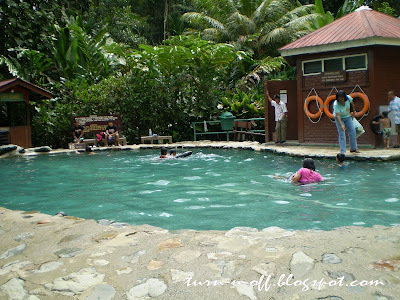 Rock pool at Poring Hot Springs, which is part of the vast Kinabalu National Park. My cousin sister, Salina and I soaked our tired legs in the mineral hot tub. At night, we stopped at Lahad Datu for an awesome dinner. By 10 pm, we arrived at Tawau, our home sweet home, finally. Phew! 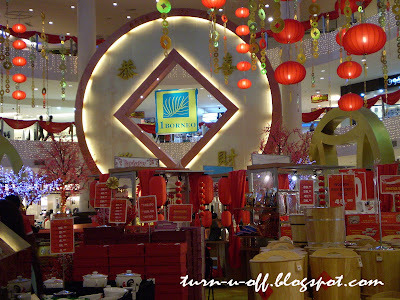 Chinese New Year theoretically is not over yet. 4 more days to go till Chap Goh Meh (the fifteenth and final day of the Lunar New Year)! Enjoy! Well, I'd love to write more and put up more pictures, but I am afraid you can't digest. So I'll be adding tons more pictures as time goes on, I'm sure. I'm so jealous... I've been wanting to go Sabah and not forgetting Sarawak too.. Those 2 states are the onlyl states in Malaysia I have yet to step on.. lol! Welcome home and a belated very happy birthday to you also!! I am back blogging and have been waiting for you to get home. I missed you and everyone so much!! Oh wow Monica the pictures are simply beautiful. I would love to visit there. it looks like you had a fantastic time!! ms. monica! great that you've come back to blogging! oh! so that was your birthday celebration! great! i observed that you really were enjoying your trip! 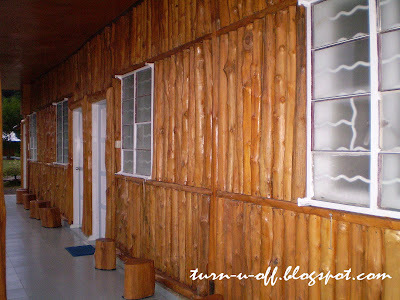 Are the cabins made of real wood or plastic replica? nice photos u have ..and the roasted jagung is seriously roasted. lol. sounds like you're having a wonderful CNY. That's quite a fun holiday you had. I'm sure God has already had beautiful plans for you and that's the most beautiful gift. Woohhhooo.. I see someone is using JS too... Ohh this is so much fun!!! So when was ur birthday la? Great; I hope you enjoy your trip to KK! welcome back, my dear!s AND blated Happy B'day to you! Tenom is well-known for its fragrant coffee becuase I once had friends bring it to me. 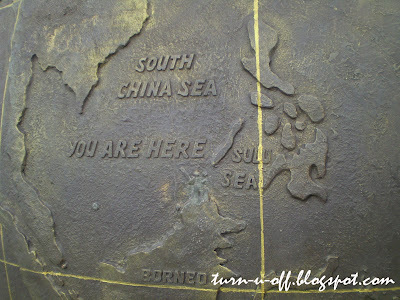 I so want to visit Sabah now! It looks like a gorgeous place for a holiday. Babe you got so banyak-banyak pictures!!! 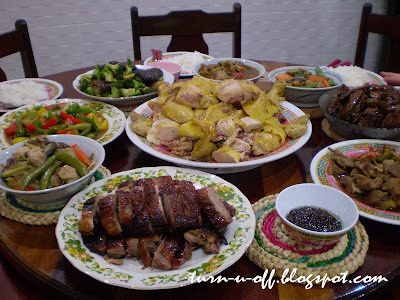 Hehehe It looks like you had a great holiday and wow that CNY dinner looks real good!! Thanks for dropping by Monica! Those pictures of yours just show how great and fun-filled your vacation was. yeah, you must go visit Sabah one day...hehe! btw, you are living in KK right? I had roti susu just now...LOL! what abt you? That view of the mountain is just majestic! Kota Kinabalu is one of the place I would love to visit but maybe I'll wait when we are already living in the Philippines as it is closer to fly from Manila I think. Would´n´t mind visiting that lovely countryside and stay in the cabins, it looks so peaceful there.